Idiomatic expressions are a type of informal English that have a meaning different from the meaning of the words in the expression. Here's an example of an idiomatic expression. This idiom does not actually mean that you should stick your fingers in your mouth and grab a hold of your tongue. It means that you should not talk. People "hold their tongues" when they are in situations where they want to talk, but it would be better if they didn't. So, while their tongue is ready to do some talking, they "hold" it and don't say anything. Every language has idioms, and they can be difficult to learn if you are not a native speaker of that language. 1. She was tickled pink by the good news. 2. You were hands down the best player on the team. 3. I've been feeling pretty down in the dumps lately. 4. I'm feeling sick as a dog! 5. I've been feeling under the weather. Wake up and be happy! 7. Close, but no cigar. You were very close, but you did not make it. 8. I could play outside till the cows come home. 9. Wow! 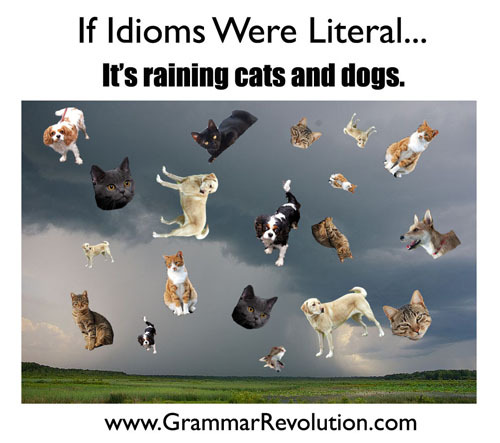 It's raining cats and dogs out there! 10. That sound is driving me up the wall! 11. This assignment is a piece of cake. 12. Although he broke the rules, he was only given a slap on the wrist. 13. Yikes! This shirt costs an arm and a leg. 14. No, I was just pulling your leg. 15. It's Greek to me! 16. Keep your chin up. 18. We're all in the same boat. All of us are in the same position. 19. He's a bit of a loose cannon. 20. I will clean my room when pigs fly. Never.. because pigs will never fly.. I would like learn phrases and new words with different expressions. Maybe histories, inovation!